Zentral in Berlin-Mitte und fußläufig zum Gendarmenmarkt gelegen, entstand mit den CAPITIS Studios/Berlin im Oktober 2017 ein neuer Raum im Herzen der Hauptstadt, welcher sich mit seiner angeschlossenen Galerie als Bindeglied zwischen bekannten Köpfen und Kunst begreift. CAPITIS (lat. „des Kopfes“) möchte Rückzugsort sein für unverfälschte, ungestörte Momente und Begegnungen. Offen, eigen, rar. Wir bieten Ihnen mit unserer eleganten Eventlocation samt Mietstudios auf zwei Ebenen optimale Bedingungen für Shootings, Produktionen, Meetings, Ausstellungen, Pop-Up-Stores oder Events mit einer Gesamtfläche von mehr als 300 m². Kontaktieren Sie uns jederzeit für eine Besichtigung unserer CAPITIS Studios/Berlin – wir unterstützen Sie gern bei der Realisation Ihrer Ideen und vermitteln je nach Bedarf auch alle branchenüblichen Serviceleistungen. 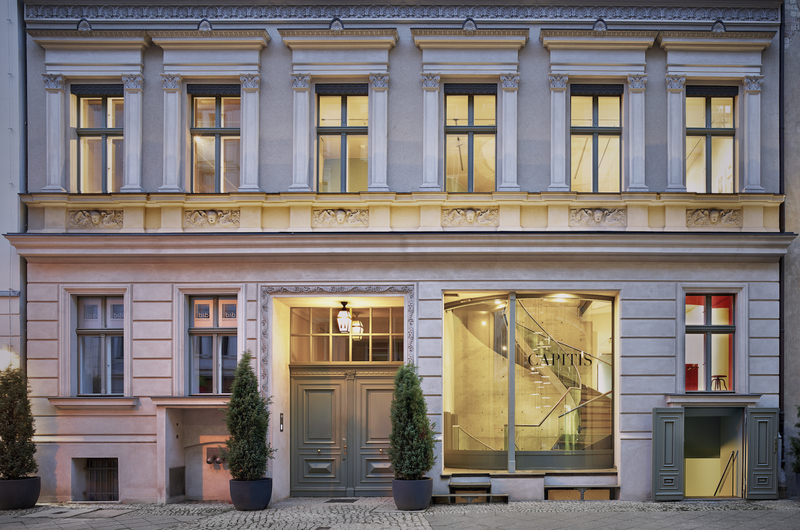 Located in the centre of Berlin and within walking distance of the Gendarmenmarkt, CAPITIS Studios/Berlin was established in October 2017 as a new space in the heart of the capital city, which sees itself with its affiliated gallery as a connecting link between well-known minds and art. CAPITIS (lat.”of the head”) wants to be a place of retreat for unadulterated, undisturbed moments and encounters. Open, original, rare. With our elegant event location and rental studios on two levels, we offer you optimal conditions for shootings, productions, meetings, exhibitions, pop-up stores or events on a total of approx. 300 sqm. Contact us at any time for a tour of our CAPITIS Studios/Berlin – we are happy to support you in the realisation of your ideas and can also arrange the usual services such as catering, shuttle service or security as required.